The day before his fight against Manny Pacquiao, Floyd Mayweather took two intravenous infusions totaling 750 milliliters. The bags contained mixtures of saline and vitamins, but their contents are irrelevant: any IVs over 50 mL are strictly banned. The Nevada State Athletic Commission, which sanctioned the fight, did not learn of the IV until three weeks after the fight—by which time Mayweather had already sought and received an exemption from his favored drug-testing agency. Thomas Hauser has reported for SBNation a story that should leave readers entirely cynical about the motives of the United States Anti-Doping Agency, an independent, not-for-profit corporation contracted to perform drug testing for anyone who will pay. That includes the Olympics, that includes cycling, and that includes Floyd Mayweather. You should read the whole story for the bigger picture of how USADA—headed by Travis Tygart, Lance Armstrong’s own personal Javert—gives favored treatments to its most frequent and higher paying clients. 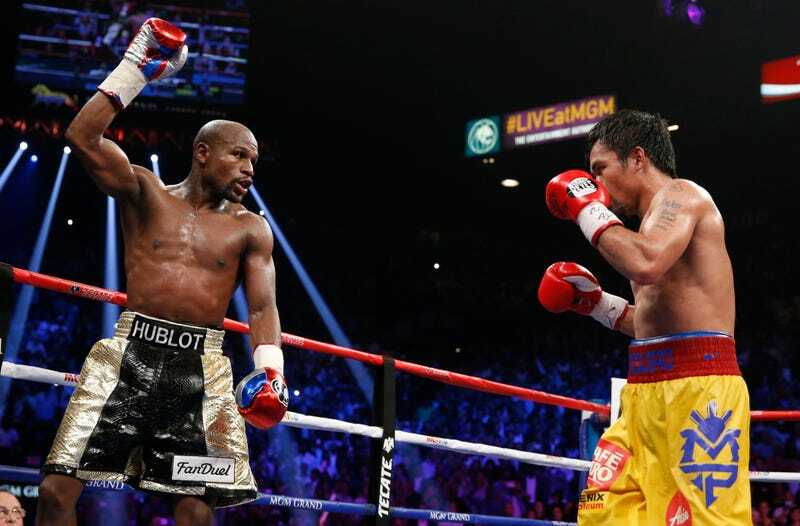 (Mayweather apparently tested positive for illegal performance-enhancing drugs on three separate occasions. Each time, USADA gave Mayweather an inadvertent-use waiver, and did so before his “B” samples were tested. Because of that, the positive results did not have to be reported to Mayweather’s opponents or to the bodies sanctioning his fight. In a completely unrelated fact, USADA was paid $150,000 to handle the drug testing for Mayweather-Pacquiao, or more than four times as much as it charged to do the testing for another title fight two weeks earlier.) But the Mayweather IV story is instructive on its own. After his weigh-in on May 1, Mayweather received a 250-milliliter mixture of saline and multivitamins and 500 mL of saline and Vitamin C. The benefit is obvious: there’s no more rapid way to rehydrate after making weight. But the World Anti-Doping Agency bans all IVs because they have a potentially sinister purpose: they can dilute or mask the presence of another substance. USADA purports to use WADA’s regulations, but despite the IV being strictly against the rules, it did not notify the NSAC. On May 19, Mayweather applied for a retroactive therapeutic-use exemption for the IV. On May 20, USADA granted it. On May 21, USADA finally told the NSAC. Retroactive therapeutic-use exemptions are not standard in the industry, but were made available for this fight in the contract Mayweather and Pacquiao signed. Remember, it was Mayweather’s insistence on strict drug testing that held up the bout for so long. (And Mayweather’s long insinuations that Pacquiao was doping, over which Pacquiao eventually filed a defamation suit that was settled out of court.) That contract and those drug-testing procedures, which Hauser’s article shows are historically not nearly as strict as USADA or Mayweather claim, not only brought in USADA but allowed for the exemption that Mayweather used to clear his name before the sanctioning body was even aware he had broken the rules. On May 2, the day of the fight, Manny Pacquiao applied directly to the NSAC for a therapeutic-use exemption for an injection of legal painkiller Toradol. He was turned down and refused the shot because his request had not been made in a “timely” manner. Boxing’s shady, Mayweather is shady, but no one is shadier than USADA, which in addition to its contracted work received $10 million a year from the federal government. USADA is only subjection to oversight from congress and federal law enforcement, but there appears to be no appetite for puncturing the convenient fiction that America’s chosen anti-doping warriors are unbiased or on the level. There’s too much money involved for everyone, from the fighters to the promoters to the governing bodies to the “not-for-profit” drug testers for anyone to worry about being clean.